The orchestra has named Jessica Sindell, 28, assistant principal flute, starting immediately. She succeeds Marisela Sager, who held the seat for thirteen seasons. 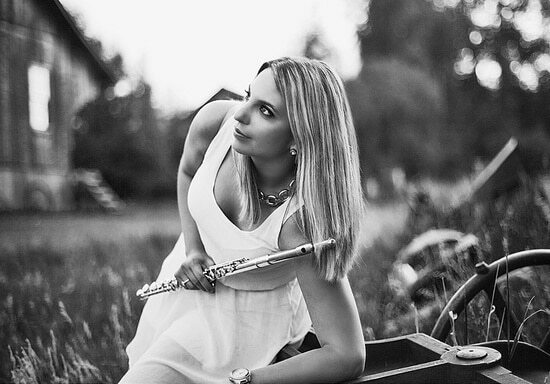 A graduate of the Cleveland Orchestra Youth Orchestra, Jessica joined the Oregon Symphony as principal flute in 2012, moving on to the Rochester Philharmonic. ‘Returning home to Cleveland to join this world-class orchestra is a dream come true,’ she said today. A picture may say more than a thousand words, but many pictures of young female musicians say exactly the same twelve words these days : “Although I play an instrument, I am still very feminine and self-conscious”. What happened to the 988 other words ? What do the pictures of young male musicians say? Some of them would seem to be conscious of their appearance as well. I see the occasional male instrumentalist listed as being a part-time or past fashion model, but no females come to mind with similar resumes. An attractive young female violinist of my acquaintance once reported a rather hilarious post-concert encounter with an audience member who clearly had an issue with the publicity photos. The best part was that the AYFV’s husband was there, and said he’d helped choose the photos! Also, I feel compelled to point out that the clarinetist in the video looks particularly sluttish, with his shirt untucked and his top button unbuttoned. He clearly wants us to think he was engaged in some frantic backstage sexytimes right before he had to rush out onstage and perform. She sounds wonderful in this video, in the company of top-flight, star wind players. The great Cleveland Orchestra is where she belongs. A fine collection of winds from different orchestras playing Ravel – a delight to hear! You cannot possibly be insinuating what I think you’re insinuating; the man is gay as a goose, you do know this, yes? Maybe by “a particular type of flutist” he meant “good.” I doubt it though. Why do some female musicians continue to use even mildly physically suggestive or provocative photographs for professional purposes? Doesn’t that in some small way demean the integrity of their hard-won artistic standing? No. First of all, I don’t find the photo suggestive; I do find it whimsical. Young musicians are challenging the staid head shot, and I say, good for them! Maybe they think that more people will buy tickets/recordings? The artist did, after all, generally choose the photographer and select the photographs that they provide to the media, it might be reasonable to conclude that what they got is what they wanted. Some of the photographers have very definite “looks” – Lisa-Marie Mazzucco’s work is usually instantly recognizable, for example. I applaud her for not doing the cliché, bedroom-eyes portrait but I do find her picture suggestive. It suggests she has just tripped over some rusting farm implement while wandering behind the barn. What happened to the previous flutist to depart in mid-season? Oh, no, absolutely not. Please. Do not demean her many accomplishments just because she happens to be a beautiful person and a beautiful woman. Jessica is professional, dedicated, perfectionist and the comments above, if I might say, are a bit disrespectful and macho-oriented. She really does not deserve that frame now. We CAN see a successful, accomplished female flute player and leave it at that without adding physical attributes, right? Plus, there are plenty of photos of guys and gals who could be seen as provocative just with their eye expressions. Bravo, well deserved! Jessica earned it, and Cleveland is lucky to land a bright, experienced and driven player whom I am honored to have played with.